Trending at $37.59eBay determines this price through a machine learned model of the product's sale prices within the last 90 days. 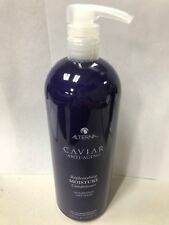 Alterna Caviar Anti-Aging MOISTURE Shampoo, Conditioner 8.5 oz - YOU CHOOSE!!! 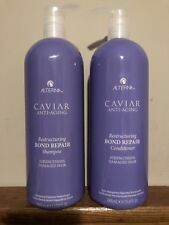 Alterna Caviar Restructuring Bond Repair Shampoo 8.5oz/250ml. Alterna Caviar Restructuring Bond Repair Conditioner 8.5oz/250ml. We are very serious against false claims. Any attempts with intend to manipulate our system will result in appropriate repercussions. À >>>>>Free Samples on Every Order <<<<<< ß -----. 1 shampoo 16.5 fl oz / 487 ml. - 1 conditioner 16.5 fl oz / 487 ml. The Duo Set includes. Alterna Caviar Anti-Aging Moisture Shampoo & Conditioner Choose! ALTERNA Caviar Anti Aging Replenishing Moisture Shampoo Conditioner Set 40ml. Condition is New. Shipped with USPS First Class Package. Alterna Caviar Anti-Aging BOND REPAIR Shampoo, Conditioner 8.5 oz ** YOU CHOOSE! Sample size: 0.25 fl oz/7 ml each. Caviar Anti-Aging. (1) Shampoo 8.5 oz. (1) Conditioner 8.5 oz. Body Building. 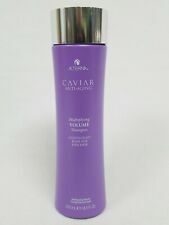 Alterna Caviar Replenishing Moisture Shampoo & Conditioner Duo *** YOU CHOOSE!!! Trending at $123.72eBay determines this price through a machine learned model of the product's sale prices within the last 90 days. Alterna Caviar Repair Travel Kit includes instant recovery shampoo, instant recovery conditioner and re-texturizing protein cream. This three piece travel kit works together to improve the overall condition and health of each strand of hair. ALTERNA Caviar Repair RX - Travel Size Set. (1) Instant Recovery Shampoo 1.35 fl oz. (1) Instant Recovery Conditioner 1.35 fl oz. 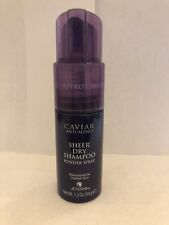 Alterna Caviar Repair Instant Recovery Shampoo (8.5 Fl Oz). Condition is New. Seals and reinforces the cuticle layer with a defensive shield that strengthens the strand, increasing resistance to breakage. Perfect for dry hair. Free of Sulfates and Parabens. Alterna Caviar BOND REPAIR Shampoo & Conditioner Duo *** YOU CHOOSE THE SIZE!!! ALTERNA makes high-performance hair care products inspired by skin care science. ALTERNA products are free of gluten, sulfates, parabens and synthetic color, and. ALTERNA HAIRCARE. About ALTERNA It protects hair from UVA, UVB and visible light including artificial light sources. 1.35 Fl.Oz. - 0.85 Fl.Oz. / 25 mL Anti-Aging Restructuring Bond Repair Leave-In Heat Protection Spray. Size: Travel Size. Alterna Clinical Densifying Shampoo 8.5oz Condition is New. Shipped with USPS First Class Package.